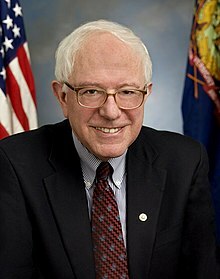 Bernard "Bernie" Sanders (born September 8, 1941) is an American politician. He is the Democratic United States senator from Vermont. Before 2019, Sanders was an Independent, but sided with the Democratic Party in the Senate. He became senator on January 3, 2007. On February 19, 2019, Sanders announced a second presidential campaign to win the Democratic nomination in the 2020 presidential election. Following his announcement, Sanders has been seen as a front-runner for the nomination in national polling alongside with former Vice President Joe Biden. In March 2016, Sanders (green) won the Michigan Primaries by less than 2% in a "political upset"
On March 1, 2016, "Super Tuesday", Sanders won four states: Vermont, Oklahoma, Colorado and Minnesota. He lost Massachusetts by less than 1%. He lost Alabama, American Samoa, Arkansas, Georgia, Tennessee, Texas, and Virginia during the event. On March 5, 2016, "Super Saturday", Sanders won two states: Kansas by 35% and Nebraska by almost 15%. He lost the Louisiana primary by about 48% during the event. On March 6, 2016, Sanders won the Maine caucuses by almost 65%. On March 8, 2016, Sanders lost the Mississippi primaries by 65%. On the same day, Sanders won the Michigan primaries by 2%. On March 12, 2016, Sanders lost the Northern Mariana Islands caucus by 20%. On March 15, 2016, Sanders lost the Florida, North Carolina, Ohio, Illinois, and Missouri primaries. In the 2018 midterms, Sanders supported many progressive candidates. A few of the people he endorsed ended up winning their primaries. For example, in an upset that surprised many people, including the candidate herself, Alexandria Ocasio-Cortez beat the incumbent Joseph Crowley for United States Representative in New York City. Benjamin Jealous became the Democratic nominee for Governor of Maryland. Ironworker Randy Bryce and former Chicago mayoral candidate Chuy García ran for United States Representative in Wisconsin and Illinois respectively, and Tallahassee mayor Andrew Gillum won the Democratic party's nomination for Governor of Florida. Despite winning their primaries, only Ocasio-Cortez and García won their respective general elections. Sanders had been asked many times if he would run for president again in the 2020 presidential election. Sanders would respond by stating "it is much too early to talk about that", but refused to rule out a possible second presidential campaign. After a poll was made in February 2017, 20% of Democratic voters wanted Sanders to be the party's nominee in the 2020 presidential election, leading Hillary Clinton at 17% and Elizabeth Warren at 15%. In March 2017, at 14%, Sanders was the Democratic voters front-runner for the Democratic nomination in 2020, beating Michelle Obama at 11%. In September 2017, at a polling of 28%, Sanders remained the lead candidate for the Democratic Party nominee in the 2020 election beating Warren, former Vice President Joe Biden and Senator from California Kamala Harris. In most of the 2018 polls, Sanders leading the nomination in second place, behind former Vice President Biden. In January 2019, it was reported that it is certain Sanders would enter the 2020 race following his lead in the contested race and an announcement would be immediate. On February 15, 2019, it was reported that Sanders recorded his presidential announcement video for a 2020 bid. He announced his second presidential bid on February 19, 2019. Within three-and-a-half hours after his announcement, Sanders had raised over $1 million from small donations from all 50 states, breaking the record held by Senator Kamala Harris after her presidential announcement. Within 12 hours, Sanders had raised over $4 million from 150,000 donors, and in the first 24 hours following his announcement, Sanders raised $5.9 million from 225,000 small donations, with the average donation being $27. On March 2, 2019, Sanders held his first presidential rally in Brooklyn College in New York City. The next day, Sanders held a second rally at Navy Pier in Chicago. About 13,000 people went to the Brooklyn rally and 12,500 went to the Chicago rally. On March 5, 2019, Sanders signed a formal statement, called a "loyalty pledge", saying that he is a member of the Democratic Party and will serve as a Democrat if elected. The day before, he had signed paperwork to run as an independent for re-election to his Senate seat in 2024. Later that month, national polling had Sanders and former Vice President Joe Biden tied for the Democratic primaries. In April 2019, a national poll had Sanders leading Biden 29% to 24% among Democratic voters for the primaries. Sanders married Deborah Shiling in 1964. The couple divorced two years later in 1966. He met his second wife, Jane O'Meara, when Sanders became mayor of Burlington, Vermont in 1981. They were married in 1988. Sanders has a son, Levi Sanders, who was born out of wedlock with his domestic partner Susan Campbell Mott. Sanders and Mott were partners only one year before splitting in 1969. Sanders has three step-children from O'Meara: Dave, Carina and Heather Driscoll. He thinks of them as his own children. They live in Burlington. His brother, Larry, was a Green Party County Councillor representing East Oxford in England until his retirement in 2013. In August 2017, Sanders published another political book titled Bernie Sanders Guide to Political Revolution which is aimed to help teenagers to get involve in the political scene. In November 2018, he published another book titled Where We Go From Here, talking about how the aftermath of his 2016 campaign created a progressive movement and what Americans need to do to stand against the Trump presidency. ↑ 3.0 3.1 Peter Nicholas (July 26, 2016). "Bernie Sanders to return to the Senate as Independent". The Wall Street Journal.com. Retrieved July 28, 2016. ↑ 4.0 4.1 Blomquist, Dan; Robert Way (November 5, 2015). "Bernie Sanders files for Democratic ballot in N.H. primary". Boston Globe. ↑ Paul Kane (April 30, 2015). "Sanders takes on 'billionaire class' in launching 2016 bid against Clinton". The Washington Post. Retrieved April 30, 2015. ↑ 6.0 6.1 "Why Bernie Sanders is going to Alabama two weeks before the Iowa caucuses". Washington Post.com. January 18, 2016. Retrieved January 15, 2016. ↑ 7.0 7.1 7.2 7.3 7.4 7.5 7.6 7.7 7.8 "Bernie Sanders: Fast Facts". CNN.com. May 30, 2015. Retrieved June 8, 2015. ↑ 8.0 8.1 8.2 "Bernie Sanders confirms presidential run and damns America's inequities". The Guardian. Associated Press. April 29, 2015. Retrieved June 4, 2015. ↑ Lerer, Lisa (July 16, 2009). "Where's the outrage over AIG bonuses?". The Politico. Retrieved April 19, 2010. ↑ Sanders, Bernie (May 26, 2013). "What Can We Learn From Denmark?". The Huffington Post. Retrieved August 19, 2013. ↑ McMurry, Evan (May 3, 2015). "Bernie Sanders: America Should Look More Like Scandinavia". Mediaite. Retrieved June 4, 2015. ↑ 12.0 12.1 Rappeport, Alan (April 29, 2015). "Bernie Sanders Announces He Is Running for President". The New York Times. Retrieved April 30, 2015. ↑ 13.0 13.1 Vicki Needham (December 12, 2014). ""Senate Democrats lock in key committee memberships."". The Hill. ↑ Dreier, Peter (May 5, 2015). "Bernie Sanders' Socialism Is as American as Apple Pie". The Huffington Post. Retrieved May 5, 2015. ↑ Cogan, Marin. "Bernie Sanders Is Officially Running for President — That Doesn't Mean You Can Ask Him About Hillary Clinton". New York magazine. ↑ "VIDEO: Bernie Sanders announces run for president". The Burlington Free Press,. May 26, 2015. Retrieved May 27, 2015. ↑ Bradner, Eric (April 30, 2015). "Sanders doesn't want billionaires' backing". CNN. Retrieved May 4, 2015. ↑ 18.0 18.1 Sofia Tesfaye (June 16, 2015). "America is feeling the Bern: Bernie Sanders draws overflow crowds — and surges in the polls". Salon.com. Retrieved June 16, 2015. ↑ 19.0 19.1 19.2 Seelye, Katherine Q. (25 June 2015). "New Hampshire Poll Shows Bernie Sanders in Dead Heat With Hillary Clinton". The New York Times. Retrieved 26 June 2015. ↑ 20.0 20.1 Jeff Zeleny (July 12, 2016). "Bernie Sanders endorses Hillary Clinton". CNN.com. Retrieved July 12, 2016. ↑ 21.0 21.1 "Democrats Nominate Hillary Clinton Despite Sharp Divisions". The New York Times.com. July 26, 2016. Retrieved July 26, 2016. ↑ 22.0 22.1 22.2 Guadiano, Nicole (July 15, 2016). "Bernie Sanders will launch organizations to spread progressive message". USA Today. USA Today. Retrieved July 27, 2016. ↑ Adam Gabbatt (April 11, 2017). "The Bernie Sanders Show is interactive TV talk for the era of Facebook activism". The Guardian. Retrieved June 16, 2017. ↑ 24.0 24.1 CNN, Gregory Krieg. "Bernie Sanders launches second presidential campaign". CNN. Retrieved 2019-02-19. ↑ 25.0 25.1 "National Poll: Sanders Tied with Biden; Beto Gets Post-Announcement Bump". Emerson Polling. March 19, 2019. Retrieved April 22, 2019. ↑ 26.0 26.1 "Bernie Sanders leads Joe Biden in Emerson national poll of 2020 contenders". USA Today. April 16, 2019. Retrieved April 22, 2019. ↑ Leibovich, Mark (January 21, 2007). "The Socialist Senator". New York Times. ↑ Kelly, Amita (April 29, 2015). "5 Things You Should Know About Bernie Sanders". NPR. Retrieved July 19, 2015. ↑ 29.0 29.1 29.2 29.3 Leibovich, Mark (January 21, 2007). "The Socialist Senator". The New York Times Magazine. Retrieved July 18, 2007. ↑ 30.0 30.1 Stone, Kurt (2010). The Jews of Capitol Hill: A Compendium of Jewish Congressional Members. Scarecrow Press. p. 483. ↑ Gaudiano, Nicole (April 28, 2015). "6 things to know about Bernie Sanders". OnPolitics. USA Today. Retrieved July 19, 2015. ↑ van Zuylen-Wood, Simon (June 21, 2014). "I'm Right and Everybody Else Is Wrong. Clear About That?". National Journal Magazine. http://www.nationaljournal.com/magazine/i-m-right-and-everybody-else-is-wrong-clear-about-that-20140618. Retrieved July 18, 2015. ↑ Chana, Jas (20 August 2015). "Straight Outta Brooklyn, by Way of Vermont: The Bernie Sanders Story". Tablet (magazine). Retrieved 20 January 2016. ↑ Ross Barkan (August 4, 2015). "Why Bernie Is Probably Not Going to Talk About His Mom as Much as Hillary Will". Observer.com. Retrieved January 30, 2016. ↑ Craven, Jasper. "Can Sanders' civil rights experience at U. of C. translate on campaign trail?". Chicago Tribune.com. Retrieved September 10, 2015. ↑ Barre Montpelier Times Argus (August 25, 2013). "Sanders was part of 1963 March on Washington". timesargus.com. ↑ Tom Murphy (May 29, 2015). "Read 21-Year-Old Bernie Sanders' Manifesto on Sexual Freedom". Mother Jones.com. Retrieved January 18, 2016. ↑ 38.0 38.1 38.2 "Sen. Bernard Sanders (I-Vt.)". RollCall.com. August 19, 2015. ↑ Nelson, Garrison (September 14, 2014). ""Jim Jeffords: Reluctant Rebel" Section: "1974: Changing the Congressional Guard"". vtdigger.org. Retrieved May 2, 2015. ↑ "Arena Profile: Sen. Bernie Sanders". Politico.com. August 19, 2015. ↑ Bernard Sanders (1979). Eugene V. Debs: Trade Unionist, Socialist, Revolutionary, 1855–1926 – Introduction on YouTube. Retrieved July 13, 2015. ↑ 42.0 42.1 42.2 42.3 "Leaving Brooklyn, Bernie Sanders Found Home In Vermont". NPR.Org. June 30, 2015. Retrieved July 1, 2015. ↑ 43.0 43.1 43.2 Steph Mochado (May 26, 2015). "Vermont's Sanders Kicks Off 2016 Bid From Clinton's Left". My Champlain Valley.com. Retrieved May 26, 2015. ↑ 44.0 44.1 44.2 Reynolds, David B. (1997). Democracy Unbound: Progressive Challenges to the Two Party System. South End Press. ISBN 978-0-89608-563-3. ↑ 45.0 45.1 Michael Kurse (June 15, 2016). "Bernie Sanders, The Early Years". Politico.com. Retrieved January 30, 2016. ↑ "WSJ Sanders Profile". The Wall Street Journal. Retrieved January 18, 2013. ↑ 47.0 47.1 "VT At-Large Race – Nov 08, 1988". Our Campaigns. Retrieved February 17, 2013. ↑ Pertman, Adam (November 11, 1990). "'The Times Caught Up' To Vermont Socialist". The Boston Globe. ↑ "Vermont State archives, Race – 1994". Retrieved June 18, 2015. ↑ "Final Vote Results for Roll Call 534". Office of the clerk, US House of Representatives. Retrieved July 18, 2007. ↑ "Final Vote Results for Roll Call 614". US House of Representatives. Office of the clerk. Retrieved November 17, 2014. ↑ 55.0 55.1 Bernie Sanders (May 7, 2015). "Bernie Sanders: It's Time To End Orwellian Surveillance of Every American". Time. Retrieved May 19, 2015. ↑ "PATRIOT ACT: Libraries and First Amendment". Retrieved May 19, 2015. ↑ "Our Campaigns - VT US Senate Race - Nov 07, 2006". ourcampaigns.com. 2008. Retrieved August 25, 2015. ↑ "Bernie Sanders confirms presidential run and damns America's inequities". The Guardian. April 29, 2015. Retrieved April 30, 2015. ↑ Totten, Shay (January 15, 2007). "Sanders to push global warming legislation in Senate". Vermont Guardian. Sen. Bernie Sanders, I-VT, said Monday he was making good on at least one of a handful of campaign promises — introducing a bill designed to cut U.S. contributions to global greenhouse gas emissions in the next decade. ... Sanders added that construction of new power plants is "extraordinarily expensive" and he would prefer to see federal funding support used to expand the development of sustainable energy, as well as biofuels. ↑ Bernie Sanders (December 10, 2010). "Sanders, Bernie "If We Don't Overturn Citizens United, The Congress Will Become Paid Employees of the Billionaire Class"". Huffington Post. Retrieved August 1, 2011. ↑ Byron Tau (April 29, 2015). "Rand Paul, Bernie Sanders Revel in NSA Ruling". The Guardian. Retrieved April 30, 2015. ↑ Michael A. Memoli (December 10, 2010). "Memoli, Michael "Sen. Bernie Sanders ends filibuster"". Los Angeles Times. Retrieved August 1, 2011. ↑ Nichols, John (December 29, 2010). "That 'Sanders for President' Talk is Real Enough, But Bernie's Not Going There". The Nation. ↑ Michael Ross (May 24, 2011). "Mr. Sanders' Blows Washington in 'The Speech'". Pop Matters.com. Retrieved March 17, 2016. ↑ John Nichols (October 30, 2012). "How Does Bernie Sanders Do It?". The Nation.com. Retrieved July 1, 2015. ↑ "Senate: Vermont (Sanders vs MacGovern)". Election Center 2012. CNN. November 12, 2012. ↑ "Bernie Sanders: Biography". Biography.com. Retrieved January 18, 2016. ↑ Joseph Lawler (December 26, 2014). "Sanders names 'deficit owl' his chief economist". Washington Examiner. Retrieved March 25, 2015. ↑ Resnikoff, Ned (February 19, 2015). "Bernie Sanders, mulling presidential run, adopts novel stance on deficit". Al Jazeera. Retrieved March 25, 2015. ↑ 71.0 71.1 Bernie Sanders (November 11, 2016). "Bernie Sanders: Where the Democrats Go From Here". The New York Times. Retrieved November 14, 2016. ↑ McCausland, Phil (January 5, 2017). "Bernie Sanders Makes Big Statement With Oversized Trump Tweet". NBC News. ↑ Panzer, Javier (February 21, 2017). "Bernie Sanders in Los Angeles: 'The truth is that Trump is a pathological liar'". Los Angeles Times. ↑ Ernst, Douglas (March 30, 2017). "Sanders: Prioritizing jobs over climate change is 'stupid and dangerous'". Washington Times. ↑ Swoyer, Alex (April 4, 2017). "Sanders rejects Gorsuch over Citizens United, Roe v. Wade". Washington Times. ↑ Pignataro, Juliana Rose (April 7, 2017). "Bernie Sanders Slams Trump's Airstrike On Syria". International Business Times. ↑ Kentish, Ben (2 June 2017). "Bernie Sanders praises 'courageous' Jeremy Corbyn for 'revitalising democracy'". The Independent. Retrieved 15 July 2017. ↑ 79.0 79.1 Gregory Krieg (June 11, 2017). "Sanders to faithful: Take down Trump, take over Democratic Party". CNN. Retrieved October 22, 2017. ↑ 80.0 80.1 Common Dreams staff. "The People's Summit: LIVE from Chicago". Common Dreams. Retrieved June 14, 2017. ↑ 81.0 81.1 "US bill on Russia sanctions prompts German, Austrian outcry". Deutsche Welle. June 15, 2017. ↑ Costa, Robert (June 14, 2017). "Acquaintance describes campaigning for Bernie Sanders with shooting suspect". The Washington Post. Retrieved June 14, 2017. ↑ Pagliery, Jose (June 14, 2017). "Suspect in congressional shooting was Bernie Sanders supporter, strongly anti-Trump". CNN. Retrieved June 15, 2017. ↑ Difazio, Joe (June 14, 2017). "Bernie Sanders Reacts To Alexandria Shooter Serving As A Campaign Volunteer". International Business Times. Retrieved June 14, 2017. ↑ "Bernie Sanders to Sponsor Single-Payer Healthcare Bill". Newsweek. Mar 26, 2017. ↑ Paul Demko (September 7, 2018). "Obama touts Medicare for all as evidence of Democrats' new ideas". Politico. Retrieved October 10, 2018. ↑ "Bernie Sanders speech at Women's Convention prompts backlash". CNN. October 12, 2017. Retrieved October 22, 2017. ↑ Saba Hamedy (October 20, 2017). "Bernie Sanders bows out of Women's Convention to make trip to Puerto Rico". CNN. Retrieved October 22, 2017. ↑ "Bernie Sanders warns of 'international oligarchy' after Paradise Papers leak". The Guardian. November 6, 2017. Retrieved November 6, 2017. ↑ Erin Durkin (January 1, 2018). "Mayor de Blasio sworn in for second term by Bernie Sanders". New York Daily News. Retrieved January 1, 2018. ↑ 92.0 92.1 "Government shutdown: Where the senators stand". CNN. January 19, 2018. Retrieved January 23, 2018. ↑ Diaz, Daniella. "Bernie Sanders holds his own SOTU speech on-line". CNN. Retrieved February 4, 2018. ↑ 94.0 94.1 "Sanders cheers students protesting gun violence: 'We are very proud'". The Hill. March 14, 2018. Retrieved August 28, 2018. ↑ SCHOR, ELANA; LIN, JEREMY C.F. "The Hell-No Caucus: How five 2020 contenders voted on Trump's nominees". Politico. Retrieved 6 April 2018. ↑ 96.0 96.1 Kampf-Lassin, Miles (May 9, 2018). "Bernie Sanders Has a Sweeping Plan to Expand Union Rights and Workplace Democracy". In These Times. Retrieved May 12, 2018. ↑ "Vermont Primary Election Results". ↑ "Sanders to run as a Democrat — but not accept nomination". POLITICO. Retrieved 2018-05-22. ↑ 99.0 99.1 "Bernie Sanders' 'Stop BEZOS' bill targets worker pay at Amazon and Walmart". CNN. September 7, 2018. Retrieved September 8, 2018. ↑ Sara Salinas (October 2, 2018). "Amazon raises minimum wage to $15 for all US employees". CNBC. Retrieved October 9, 2018. ↑ 101.0 101.1 Sylvia Lane (October 3, 2018). "Bernie Sanders Introduces Bill to Break Up Big Banks". The Hill. Retrieved October 9, 2018. ↑ "Tim Kaine, Bernie Sanders cruise to re-election". NBC News. November 6, 2018. Retrieved November 6, 2018. ↑ Sanders, Bernie. "A new authoritarian axis demands an international progressive front | Bernie Sanders". The Guardian. ISSN 0261-3077. Retrieved 2018-10-27. ↑ Varoufakis, Yanis. "Our new international movement will fight rising fascism and globalists | Yanis Varoufakis". The Guardian. ISSN 0261-3077. Retrieved 2018-10-27. ↑ "Sanders and Varoufakis Announce Alliance to Craft 'Common Blueprint for an International New Deal'". Common Dreams. Retrieved 2018-10-27. ↑ "Brazil: Haddad to Join Bernie Sanders' International Progressive Front Against The Far-Right". Telesur English. November 21, 2018. Retrieved December 23, 2018. ↑ 107.0 107.1 Jason Easerly (August 2, 2011). "Americans Love Socialism: Bernie Sanders Is The 3rd Most Popular US Senator". Politics USA. Archived from the original on November 20, 2012. Retrieved March 28, 2012. ↑ "Bernie Sanders has become the most popular politician in America — with no help from the inside". Salon. March 23, 2017. Retrieved March 27, 2017. ↑ Easley, Jonathan (April 18, 2017). "Poll: Bernie Sanders country's most popular active politician". The Hill. Retrieved April 20, 2017. ↑ "America's Most and Least Popular Senators". Morning Consult. April 19, 2018. Retrieved August 28, 2018. ↑ Nichols, John (March 6, 2014). "Bernie Sanders: 'I Am Prepared to Run for President of the United States'". The Nation. Retrieved March 6, 2014. ↑ 112.0 112.1 "Bernie Sanders to Announce Presidential Bid on Thursday". NBCNews.com. April 28, 2015. Retrieved April 28, 2015. ↑ 113.0 113.1 Levine, Sam (April 28, 2015). "Bernie Sanders To Launch Presidential Campaign". The Huffington Post. Archived from the original on April 28, 2015. Retrieved April 28, 2015. ↑ "A History of Democratic Socialists of America 1971-2017". Dsausa.org. Retrieved July 2, 2018. ↑ John Wagner (June 15, 2015). Meet the people coming to see Bernie Sanders in Iowa. The Washington Post. Retrieved June 16, 2015. ↑ 116.0 116.1 Tamara Keith (June 15, 2015). Bernie Sanders 'Stunned' By Large Crowds Showing Up For Him. NPR. Retrieved June 16, 2015. ↑ Jacobs, Ben (12 August 2015). "New poll puts Bernie Sanders ahead of Hillary Clinton in New Hampshire". The Guardian. Retrieved 12 August 2015. ↑ Janie Valencia (August 25, 2015). "Bernie Sanders surpasses Hillary Clinton in New Hampshire polls". Huffington Post.com. Retrieved August 25, 2015. ↑ Nik DeCosta-Klipa (August 25, 2015). "Second straight poll shows Bernie Sanders leading in New Hampshire". Boston.com. Retrieved August 26, 2015. ↑ 120.0 120.1 Aaron Blake (June 20, 2016). "More young people voted for Bernie Sanders than Trump and Clinton combined — by a lot". The Washington Post. Retrieved July 2, 2017. ↑ .Buzz, Carles (February 22, 2016). "Can Bernie Sanders' Dank Meme Stash Swing the Election?". Motherboard. Vice. Retrieved February 23, 2016. ↑ Nik Castelli (September 10, 2015). "Bernie Sanders overtakes Hillary Clinton in Iowa". Politico.com. Retrieved September 11, 2015. ↑ Tom LeBlancio (November 3, 2015). "Hillary Clinton edges Bernie Sanders in latest poll". CNN.com. Retrieved November 3, 2015. ↑ Allison Kopicki (November 19, 2015). "Bernie Sanders Reaches New High in Polls". NBC News.com. Retrieved November 21, 2015. ↑ "Senator Bernie Sanders on Democratic Socialism in the United States". BernieSanders.com. Retrieved November 21, 2015. ↑ Claire Forman (November 17, 2015). "Bernie Sanders Makes His Pitch for Democratic Socialism". The Atlantic.com. Retrieved November 21, 2015. ↑ Brent Badowski (December 3, 2015). "Shock Poll: Bernie Sanders is the Most Electable Candidate in Either Party". Observer.com. Retrieved December 5, 2015. ↑ "Bernie Sanders Maintains Lead in TIME Person of the Year Poll". TIME.com. November 30, 2015. Retrieved December 1, 2015. ↑ "TIME Person of the Year Reader Poll". TIME.com. December 1, 2015. Retrieved December 1, 2015. ↑ Sam Frizell (December 7, 2015). "Bernie Sanders Wins TIME Person of the Year Poll". TIME.com. Retrieved December 8, 2015. ↑ Jennifer Agiesta (December 9, 2015). "New Hampshire remains a Bernie Sanders stronghold". CNN.com. Retrieved December 11, 2015. ↑ 132.0 132.1 Veronica Stracqualursi (February 5, 2016). "Hillary Clinton Losing Her National Lead Over Bernie Sanders, Poll Shows". ABC News.com. Retrieved February 5, 2016. ↑ Maggie Haberman (January 10, 2016). "Bernie Sanders Makes Strong Showing in New Polls". New York Times.com. Retrieved January 10, 2016. ↑ River Donagehy (January 11, 2016). "Bernie Sanders Is Pulling Ahead of Hillary Clinton in Iowa, According to New Poll". Vice.com. Retrieved January 12, 2016. ↑ 135.0 135.1 Nick Corasaniti (21 January 2016). "Bernie Sanders, and Simon and Garfunkel, Put Focus on Voters". New York Times. Retrieved 22 January 2016. ↑ Andrew Rafferty (February 18, 2016). "The Lid: Bad News For Clinton Heading Into MSNBC Forum". NBC News.com. Retrieved February 19, 2016. ↑ Sophia Tesfaye (February 24, 2016). "Bernie Sanders has led Hillary Clinton in this major national poll nearly all month". Salon.com. Retrieved February 24, 2016. ↑ "American Voters Feel The Bern In November Matchups, Quinnipiac University National Poll Finds". Quinnipiac University poll. February 18, 2016. ↑ 139.0 139.1 139.2 "Bernie Sanders beats Hillary Clinton in stunning Michigan primary upset". The Guardian. ↑ "Bernie Sanders Just Changed the Democratic Presidential Race". Fortune. ↑ 141.0 141.1 Johnson, Jenna; Berman, Mark (March 12, 2016). "Post Politics Skirmishes erupt after Trump cancels Chicago rally over security concerns". The Washington Post. Retrieved March 13, 2016. ↑ Yuhas, Alan (March 12, 2016). "Sanders calls Trump 'pathological liar' as Chicago rally backlash grows". The Guardian. Retrieved March 12, 2016. ↑ "Poll: 25 percent of Sanders voters would shun Clinton". McClatchydc.com. April 6, 2016. Retrieved April 8, 2016. ↑ 144.0 144.1 Inae Oh (April 8, 2016). "Bernie Sanders to Speak at Vatican City About Social Justice". Mother Jones. Retrieved April 9, 2016. ↑ Emma Green (April 18, 2016). "The Bizarre Love Affair of Bernie and Francis". The Atlantic.com. Retrieved April 20, 2016. ↑ 146.0 146.1 Robert Reich. "Bernie Sanders". Time.com. ↑ "2016 Democratic Presidential Nomination". RealClearPolitics.com. May 3, 2016. Retrieved May 7, 2016. ↑ 148.0 148.1 Melissa Herrmann (May 4, 2016). "How Bernie Sanders Scored an Upset in Indiana Primaries". CBS News.com. Retrieved May 7, 2016. ↑ Tal Kopan (May 10, 2016). "Five takeaways from West Virginia and Nebraska". CNN.com. Retrieved June 8, 2016. ↑ "State Wide Results" (PDF). West Virginia Secretary of State. August 28, 2008. Retrieved June 8, 2016. ↑ Dann, Carrie; Todd, Chuck; Murray, Mark (23 May 2016). "First Read: Clinton's Challenge Is Winning Over Sanders Voters". NBC. Retrieved 23 May 2016. ↑ Stephen Collnson (June 6, 2016). "Hillary Clinton clinches Democratic presidential nomination". CNN.com. Retrieved June 7, 2016. ↑ Maeve Reston (June 6, 2016). "Clinton is close, but Sanders not ready to give up". CNN.com. Retrieved June 7, 2016. ↑ 155.0 155.1 Jonathan Martin (July 24, 2016). "Debbie Wasserman Schultz to Resign D.N.C. Post". The New York Times.com. Retrieved July 24, 2016. ↑ "DNCC Announces Headlining Speakers For Democratic National Convention In Philadelphia". Democratic National Convention Committee. July 15, 2016. Retrieved July 25, 2016. ↑ "Sen. Bernie Sanders' full speech from the DNC". Politico.com. July 26, 2016. Retrieved July 26, 2016. ↑ Timothy B. Lee (February 2, 2016). "Hillary Clinton barely beats Bernie Sanders in Iowa". Vox.com. Retrieved February 12, 2016. ↑ Stephen Collison (February 10, 2016). "Outsiders sweep to victory in New Hampshire". CNN.com. Retrieved February 12, 2016. ↑ Ben Kamisar (February 10, 2016). "Sanders victory over Clinton is overwhelming". The Hill.com. Retrieved February 10, 2016. ↑ "Bernie Sanders becomes first Jewish, non-Christian candidate to win U.S. primary". The Week. February 9, 2016. Retrieved February 9, 2016. ↑ Maeve Ratson (February 20, 2016). "Hillary Clinton takes Nevada in victory over Bernie Sanders". CNN.com. Retrieved February 20, 2016. ↑ "South Carolina Primary Results". The New York Times.com. February 27, 2016. Retrieved February 28, 2016. ↑ 164.0 164.1 164.2 "Super Tuesday Results". The New York Times.com. March 1, 2016. Retrieved March 1, 2016. ↑ "Bernie Sanders Wins Kansas Democratic Caucuses". ABC News.com. March 5, 2016. Retrieved March 5, 2016. ↑ Manuela Torres (March 5, 2016). "Sanders win Nebraska". Politico.com. Retrieved March 5, 2016. ↑ "Louisiana Primary Election Results". The New York Times.com. March 5, 2016. Retrieved March 5, 2016. ↑ Colin Dwyer (March 6, 2016). "Bernie Sanders Projected To Win Maine Caucuses". NPR.org. Retrieved March 6, 2016. ↑ "Mississippi Primary Election Results 2016". The New York Times.com. March 8, 2016. Retrieved March 8, 2016. ↑ "Michigan Primary Election Results 2016". The New York Times.com. March 8, 2016. Retrieved March 9, 2016. ↑ Patrick Riess (March 12, 2016). "Clinton wins Northern Mariana Islands caucus". Politico.com. Retrieved March 12, 2016. ↑ "Florida Primary Election Results". The New York Times.com. March 15, 2016. Retrieved March 15, 2016. ↑ "North Carolina Primary Election Results". The New York Times.com. March 15, 2016. Retrieved March 15, 2016. ↑ "Ohio Primary Election Results 2016". The New York Times.com. March 15, 2016. Retrieved March 15, 2016. ↑ "Illinois Primary Election Results". The New York Times.com. March 15, 2016. Retrieved March 16, 2016. ↑ "Missouri Primary Election Results 2016". The New York Times.com. March 16, 2016. Retrieved March 17, 2016. ↑ 177.0 177.1 177.2 Julia Bryan (March 21, 2016). "Democrats Abroad Primary Results". Democrats Abroad.org. Retrieved March 21, 2016. ↑ 178.0 178.1 178.2 Andrew Rafferty (March 22, 2016). "Sanders Wins Idaho and Utah While Clinton and Trump Take Arizona". NBC News.com. Retrieved March 23, 2016. ↑ Domenico Montanaro (March 26, 2016). "Despite The Math, Bernie Sanders Has Already Won". Retrieved March 27, 2016. ↑ "Wisconsin Primary Election Results". The New York Times.com. April 5, 2016. Retrieved April 6, 2016. ↑ "Wyoming Election Results 2016". The New York Times.com. April 9, 2016. Retrieved April 10, 2016. ↑ "New York Primary Election". The New York Times.com. April 19, 2016. Retrieved April 19, 2016. ↑ "Maryland Primary Results". The New York Times.com. April 26, 2016. Retrieved April 26, 2016. ↑ "Delaware Primary Results". The New York Times.com. April 26, 2016. Retrieved April 26, 2016. ↑ "Pennsylvania Primary Results". The New York Times.com. April 26, 2016. Retrieved April 26, 2016. ↑ "Connecticut Primary Results". The New York Times.com. April 26, 2016. Retrieved April 26, 2016. ↑ "Rhode Island Primary Results". The New York Times.com. April 26, 2016. Retrieved April 26, 2016. ↑ "Indiana Primary Election Results". The New York Times.com. May 3, 2016. Retrieved May 3, 2016. ↑ Robert Yoon (May 7, 2016). "Hillary Clinton wins Guam Democratic caucuses". CNN.com. Retrieved May 8, 2016. ↑ "West Virginia Primary Election Results". The New York Times.com. May 10, 2016. Retrieved May 11, 2016. ↑ "Kentucky Primary Election Results". The New York Times.com. May 17, 2016. Retrieved May 17, 2016. ↑ "Oregon Primary Election Results". The New York Times.com. May 17, 2016. Retrieved May 18, 2016. ↑ Karl de Vries (June 4, 2016). "Hillary Clinton wins Virgin Islands Democratic caucuses". CNN.com. Retrieved June 5, 2016. ↑ Eric Bradner (June 6, 2016). "Clinton wins Puerto Rico Democratic primary". CNN.com. Retrieved June 7, 2016. ↑ "New Jersey Primary Election Results". The New York Times.com. June 7, 2016. Retrieved June 8, 2016. ↑ "New Mexico Primary Election Results". The New York Times.com. June 7, 2016. Retrieved June 8, 2016. ↑ "South Dakota Primary Election Results". The New York Times.com. June 7, 2016. Retrieved June 8, 2016. ↑ "California Primary Election Results". The New York Times.com. June 7, 2016. Retrieved June 8, 2016. ↑ "North Dakota Primary Election Results". The New York Times.com. June 7, 2016. Retrieved June 8, 2016. ↑ "Montana Primary Election Results". The New York Times.com. June 7, 2016. Retrieved June 8, 2016. ↑ "District of Columbia Primary Election Results". The New York Times.com. June 14, 2016. Retrieved June 15, 2016. ↑ 202.0 202.1 202.2 Associated Press (December 19, 2016). "The Latest: 3 Hawaii electors for Clinton, 1 for Sanders". WBTV. Retrieved 2016-12-20. ↑ Collins, Steve (December 19, 2016). "Sanders vote tossed out of Maine's Electoral College". ↑ "Noam Chomsky: The Most Remarkable Thing About 2016 Election Was Bernie Sanders, Not Trump (Video)". Truthdig. May 15, 2017. ↑ beginning at minute 14:25. "PBS NewsHour full episode May 28, 2018". PBS Newshour. Retrieved June 3, 2018. ↑ Spross, Jeff. "Bernie Sanders has conquered the Democratic Party". The Week. Retrieved June 3, 2018. ↑ "Bernie Sanders' Pick Wins The Democratic Bid For Maryland Governor. Now's The Hard Part". Huffington Post. June 26, 2018. Retrieved August 28, 2018. ↑ "Randy "Ironstache" Bryce wins Democratic nomination to flip Paul Ryan's House seat". Vox. August 14, 2018. Retrieved August 28, 2018. ↑ "Jubilant 'Chuy' Garcia cruises to victory in race to succeed Gutierrez". Chicago Sun-Times. March 21, 2018. Retrieved August 28, 2018. ↑ "Trump-endorsed Ron DeSantis to face Bernie-backed Andrew Gillum in Florida governor's race". Fox News. August 28, 2018. Retrieved August 28, 2018. ↑ "Ocasio-Cortez to be youngest woman ever elected to Congress". CNN. Retrieved November 6, 2018. ↑ "Jesus 'Chuy' Garcia wins IL District 4 House seat, replacing Luis Gutierrez". ABC News. Retrieved November 6, 2018. ↑ 214.0 214.1 "What Bernie Sanders said when he was asked if he'd run for president in 2020". The Independent. 2017-01-12. Retrieved 2017-04-11. ↑ "Sanders Still Democrats' Choice for 2020, But It's Close - Rasmussen Reports™". rasmussenreports.com. Retrieved February 21, 2017. ↑ "Monthly Harvard-Harris Poll: March 2017" (PDF). Harris Interactive. March 17, 2017. Retrieved March 27, 2017. ↑ "The Zogby Poll: Feel the Bern! Sanders early favorite among 2020 Democratic presidential hopefuls". Zogby Analytics. September 12, 2017. Retrieved September 15, 2017. ↑ Jr., Perry Bacon (2018-02-23). "How Happy Should Joe Biden Be about His Lead in 2020 Democratic Primary Polls?". FiveThirtyEight. Retrieved 2018-06-05. ↑ Rowland, Geoffrey (2018-06-27). "Biden leads 2020 Dem field in new poll". TheHill. Retrieved 2018-06-28. ↑ Laura Barrón-López (January 28, 2018). "Bernie Sanders keeps 2020 speculation alive". The Washington Examiner. Retrieved January 28, 2018. ↑ Dylan Stableford (May 29, 2018). "Bernie Sanders 'is considering another run for the presidency,' former campaign manager says". Yahoo. Retrieved May 29, 2018. ↑ "Will Bernie Sanders Run Again? Senator Doesn't Rule Out a 2020 Race". Newsweek. August 15, 2018. Retrieved August 22, 2018. ↑ "Bernie Sanders Set to Announce 2020 Presidential Run". The Huffington Post. January 25, 2019. Retrieved Feb 2, 2019. ↑ "Bernie Sanders has recorded 2020 presidential announcement video". The New York Post. February 16, 2019. Retrieved February 16, 2019. ↑ Henney, Megan (February 19, 2019). "Bernie Sanders raised $1M within hours of announcing 2020 bid". Fox Business. ↑ "The Latest: Sanders' 2020 campaign raises $4M in half a day". apnews.com. Associated Press. 19 February 2019. Retrieved 19 February 2019. ↑ Thomas, Ken [KThomasDC] (February 20, 2019). "NEWS: @BernieSanders announces he's raised $5.9 million online in the first 24 hours since his presidential announcement. 225,000 individual donors. Average donation of $27" (Tweet). ↑ "Bernie Sanders Hosts First 2020 Presidential Campaign Rally in Brooklyn". TIME. March 3, 2019. Retrieved March 7, 2019. ↑ "Bernie Sanders, campaigning for president in 2020 at Navy Pier, calls for change 'from the bottom up'". Chicago Tribune. March 4, 2019. Retrieved March 7, 2019. ↑ "Why it made sense for Bernie to launch in Brooklyn, Chicago over Vermont". USA Today. March 4, 2019. Retrieved March 7, 2019. ↑ 231.0 231.1 Seitz-Wald, Alex (March 5, 2019). "Bernie Sanders signs DNC loyalty pledge: 'I am a member of the Democratic Party'". NBC News. Retrieved 7 March 2019. ↑ 232.0 232.1 232.2 232.3 Greenhouse, Emily (12 May 2015). "Getting to Know Jane Sanders, Wife of Bernie". Bloomberg. Retrieved 19 January 2016. ↑ "Councillor Larry Sanders". Archived from the original on May 19, 2014. Retrieved May 19, 2014. ↑ 234.0 234.1 Markoe, Lauren (30 April 2015). "5 Faith Facts About Unabashedly Irreligious Bernie Sanders". The Huffington Post. Retrieved 7 June 2015. ↑ Singman, Brooke (May 30, 2017). "Bernie Sanders slams GOP health care plans at New York college graduation". foxnews.com. New York City: Fox News. Retrieved 2017-05-30. ↑ 236.0 236.1 Joe Blevis (February 5, 2016). "Bernie Sanders has appeared in not one, but two low-budget rom-coms". A.V. Club.com. Retrieved February 5, 2016. ↑ 237.0 237.1 Meg Wagner (February 4, 2016). "Bernie Sanders plays rabbi Manny Shevitz in 1999 romantic comedy, goes on long-winded Brooklyn Dodgers rant". New York Daily News. Retrieved February 4, 2016. ↑ 238.0 238.1 "With A Little Help From Larry David, Bernie Sanders Does SNL". NPR.org. February 7, 2016. Retrieved February 7, 2016. ↑ Davis, Mark (September 17, 2014). "Bernie Sanders Recorded a Folk Album. No Punchline Required". Seven Days. Retrieved December 9, 2015. ↑ 240.0 240.1 Seitz-Wald, Alex (28 May 2015). "The 25 best things we learned from Bernie Sanders' book". MSNBC. Retrieved 22 January 2016. ↑ "Bernie Sanders Writing Book With Policy Ideas, Primary Reflections". Hollywood Reporter. ↑ "Bernie Sanders wrote a book that's out in November". ew.com. ↑ Rodman, Sarah (November 28, 2017). "Carrie Fisher nets Grammy nod in spoken-word category, faces off with Springsteen and Bernie Sanders". Los Angeles Times. Retrieved November 28, 2017. ↑ Flood, Alison (August 4, 2017). "Bernie Sanders aims to inspire revolution among young adult readers". The Guardian. Retrieved September 8, 2017. ↑ "Bernie Sanders's New Book 'Where We Go From Here' Is A Guide To Fighting Donald Trump's Agenda". Bustle. February 21, 2019. Retrieved April 22, 2019. ↑ Tom LoBianco (November 30, 2015). "Bernie Sanders Undergoes Elective Hernia Surgery". CNN.com. Retrieved November 30, 2015. ↑ "Bernie Sanders Undergoes Hernia Procedure in DC". NBC News.com. November 30, 2015. Retrieved November 30, 2015. ↑ 248.0 248.1 "Bernie Sanders had skin cancer removed from his cheek". Business Insider. December 15, 2016. Retrieved March 6, 2017. ↑ "Jane Sanders Bank Fraud Investigation: 5 Fast Facts You Need to Know"". Heavy. June 26, 2017. Retrieved June 26, 2016. ↑ Olivia Beavers. "FBI investigating Jane Sanders for alleged bank fraud: report". TheHill.com. Retrieved 27 June 2017. ↑ 251.0 251.1 Jaffe, Harry (June 22, 2017). "Jane Sanders Lawyers Up". Politico. Retrieved 26 June 2017. ↑ Weigel, David (June 25, 2017). "Bernie Sanders: FBI inquiry into 2010 bank loan will clear wife". The Washington Post. Retrieved June 26, 2017. ↑ 253.0 253.1 Ben Schreckinger and Jonathan Topaz (July 6, 2015). "The Socialist Surge". Politico.com. Retrieved August 18, 2015. ↑ Ben, Kamisar. "Gun control push complicates Sanders's 2020 ambitions -". The Hill. Retrieved March 25, 2018. ↑ "On the Issues: Income and Wealth Inequality". BernieSanders.com. Retrieved August 19, 2015. ↑ Samantha Lachman (July 22, 2015). "Bernie Sanders Introduces $15 Minimum Wage Bill As Federal Contract Workers Strike". The Huffington Post. Retrieved August 18, 2015. ↑ Willis, Derek; McCartney, Allison; Merrill, Jeremy B. "Represent: Senate Vote 97: Defeats Manchin–Toomey Background Checks Proposal". ProPublica. Retrieved May 28, 2018. ↑ Dash, Stephen (April 22, 2015). "What Is Bernie Sanders' Endgame for College Affordability and Student Loans?". The Huffington Post. Retrieved August 18, 2015. ↑ Resnikoff, Ned (May 19, 2015). "Bernie Sanders unveils plan for tuition-free public colleges". Al Jazeera America. Retrieved August 18, 2015. ↑ "Sanders Files Bill to Strengthen, Expand Social Security". Senate.gov. March 12, 2015. ↑ "Family values agenda: Paid family leave, paid sick leave, paid vacation" (PDF). Retrieved August 18, 2015. ↑ Bernie Sanders. "An Economic Agenda for America: 12 Steps Forward". The Huffington Post.com. ↑ Bill McKibben (September 22, 2014). "Bernie Sanders at People's Climate March: To Stop Global Warming, Get Dirty Money Out of Politics". Democracy now!. ↑ Sanders, Bernie (May 21, 2015). "The TPP Must Be Defeated". The Huffington Post. Retrieved August 18, 2015. ↑ "Flashback: Rep. Bernie Sanders Opposes Iraq War". Senate.gov. Retrieved January 18, 2016. ↑ Lyons, Kim (April 29, 2015). "Bernie Sanders' Views on Gay Marriage Show He's Been a Supporter for a Long Time". Retrieved August 19, 2015. ↑ 268.0 268.1 Tom LoBianco (November 16, 2015). "Bernie Sanders in Cleveland Talks ISIS". CNN.com. Retrieved November 21, 2015. Rosenfeld, Steven. Making History in Vermont: The Election of a Socialist to Congress. Wakefield, NH: Hollowbrook Publishing, 1992. Soifer, Steven. The Socialist Mayor: Bernard Sanders in Burlington, Vermont. Westport, CT: Bergin & Garvey, 1991. Wikimedia Commons has media related to Bernie Sanders.